Sanlam offers both cheap, and comprehensive funeral insurance products. On the lower end of the market, which is actually where many South Africans are considered, Sanlam has the iCover Family Funeral Plan. The company's more comprehensive offers is the MyChoice Funeral Plan. Owing to the low incomes of many South Africans, iCover from Sanlam offers funeral insurance at a minimum of R25 per month to get R10,000 funeral cover as of 2015. That's a fraction of what other funeral insurance companies will charge you in monthly premiums. With the iCover plan, you can get up to R40-000 funeral cover, which comes with many benefits to help you or your family deal with a burial. There are a couple of exclusions that you need to be aware of however. These include a waiting period of 12 months for cover for natural death, although accidental death is covered immediately. Suicide is covered a from 24 months after taking up the policy. The MyChoice Sanlam funeral cover policy is the most comprehensive plan that Sanlam offers. The main advantage of this plan over the iCover plan is that you can tailor your policy as you see fit. The most differentiating factor being that you can choose an amount of cover beyond the R40-000 limit imposed on iCover. 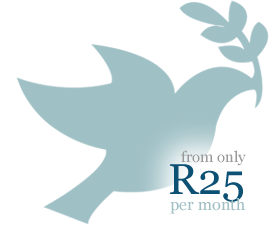 For as little as R80 per month, you can get cover for you and your family. It's that simple. Another great feature about MyChoice is that you can take up cover for your spouse and extended family without taking up cover for yourself. Sanlam is one of only a few insurers that allow you to do this. There are three main plans within MyChoice, each of which offers very compelling benefits that should make you consider Sanlam as your trusted funeral insurance partner. Sanlam is South Africa's number one insurance company. It has grown even bigger in the past few years – offering a host of funeral cover products, and much more. Millions of South Africans have a Sanlam funeral cover policy, and at your time of need – that unexpected time of death – at least you can know that the financial expenses that will arise will be taken care of by your policy.